Yup, I’m happy to report that eating one or two multi-grain wraps during the week has done absolutely no harm to my weight loss progress. It gives me respite from bean fatigue (that’s a real thing on slow carb, I swear) while still allowing me to have a healthy and balanced lunch. And let’s face it, they’re a great light alternative to bread whether you’re slow-carbing or not. Even better? This is the perfect way to use up leftover turkey from holiday celebrations. In fact, it’s a great way to use up any roast meat you might have lying around. It’s light enough to feel saintly the day after a big meal but tasty enough to feel like a treat anyway. In truth, there isn’t much to this recipe. 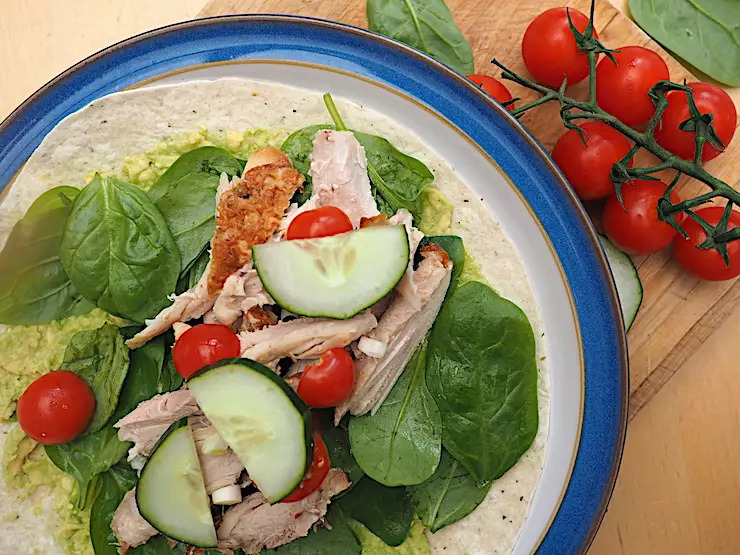 It’s full of vague volumes and directions, like ‘a few good squeezes of this’ and ‘a handful or two of that’ but that’s what makes these chicken wraps so easy to sling together – you literally can’t go wrong with them. If I’m not using leftovers, I tend to use roasted skin-on chicken thighs from the cold meat section in the supermarket – what can I say, it’s a little indulgence of mine. I find it much more flavorful and easier to eat than breast meat. But you can certainly reduce both the calorie and fat content by using skinless chicken breast if you prefer. In fact, you can swap out any of these ingredients for whatever you have to hand in the fridge, and add any sauces and condiments you feel works well with your ingredients. However, in my eyes, the perfect wrap has to include a little crunch, a little heat, and a little creaminess. And if it works with the meat, a little citrus-y punch goes a long way too. In short, I want enough light and shade in the flavor and textures to keep it interesting. 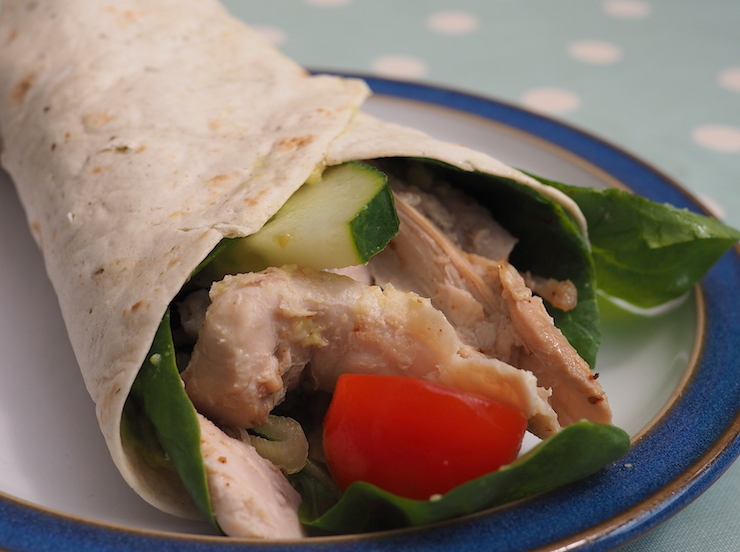 And finally – if you’re making these chicken wraps for a packed lunch, be sure to use foil when you wrap them up. These things can be hella messy, so just fold the foil down as you eat it and it’ll help to keep everything together in your hand instead of in your lap. Wrap it up burrito style and enjoy! I also like to add a few dashes of Cholula hot sauce to spice things up a bit, but feel free to embellish your chicken wraps with your own favorite condiment.